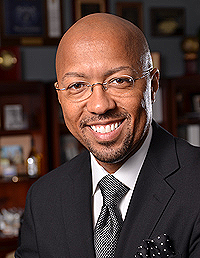 After disappearing for three months amid sexual abuse allegations, Charles Pugh officially resigned from the Detroit City Council, saying he has a new job. It’s unclear where Pugh is or what his new job is. Pugh continues to deny a mother’s claims that he lavished her high school son with gifts before pursuing a sexual relationship with him. Since then, the mother has declined to get her son involved in the investigation. he allowed himself to be nothing but a source of drama during his tenure. Sorry he threw away his potential as a journalist who seemed to connect with the public to become a preening and crooked politician. Glad he’s gone back into the private sector where he belongs. Hoping against hope he keeps his promise to never run for public office again, and that another preening, drama loving, self-serving person with enough charisma to pull votes doesn’t step up to take Mr. Pugh’s place in sucking the city dry…but bracing for that very thing. The affectation, constructed as a protective device, served him poorly. He’s extremely defensive, as demonstrated over the radio talk show airwaves, even hostile. What we all saw isn’t the real Charles Pugh, in my opinion. It was a glimpse of one man’s intense personal struggle played out on the public stage. The real Charles Pugh has likely been running and hiding forever and may be a stranger to Charles himself. Detroit was a difficult place for him to find and be himself, and his challenging background didn’t ease the way. A “geographical,” in this case, might prove helpful. While I strongly disapprove of his performance in office, I have more pity for him than anger. Well said as always, Bebow. Makes you wonder if he even knows who he is. He’s a victim of his own arrogance and insecurity. Both of which lead to his ultimate demise. He can only blame himself !!!!!!!!!!!!!!!! !